Aside from making the trek home from a childhood fair with a plastic baggie full of goldfish I had won, that somehow never managed to survive beyond a week...my favorite place to hang out at a carnival was the "Spin Art Booth". For a quarter, you could create the most magnificent artwork AND be dizzy enough to not be able to walk straight afterwards. Art and entertainment all in one. A long row of squirt bottles with different colors of paint lined the shelf looking like a rainbow. A piece of paper was attached to the spin art machine that would spin at such a high speed it was only a blur. Careful consideration was needed in choosing which color paints to combine to create the masterpiece you saw in your mind's eye. Squirt a color onto the whirling dervish canvas and the color would spin out and cover the paper in various patterns, with the excess flying off and splattering onto the sides of the machine. You never truly knew what your creation looked like until the motor slowed the spinning and the blur morphed before your eyes. Actually, you also needed to regain your equilibrium before being able to focus on it too. As an adult I travelled to Pisa, Italy and discovered the Arno River was apparently nature's spin art machine. 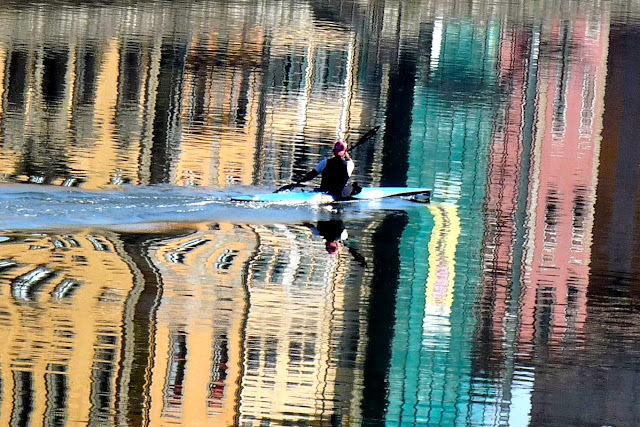 The combination of the clear reflection of multi-colored Italian store and house fronts bouncing off the waters of the Arno, and then caused to swirl, spin and morph by the paddle of a kayaker cutting through the surface, produced the same effect that 25 cents use to buy me. And many a goldfish life was saved in the process. "Spin Art in Pisa - Uno"
"Spin Art in Pisa - Due"
Love your spin art phots and the remembering of childhood fun...so glad you escaped the wrath of Irene and there is always the sensational sun that comes after the rain. Have a great week ahead. Those are amazing, Kathy...and I love the thought behind them! Wow! Love the colorful reflections! Awesome job on these! These are incredible! Really gorgeous! These are so beautiful, Kathy! What glorious colours! Love your Black Eyed Susans above too, great texture work! Thank you so much for your lovely comment, don't worry I'm so used to that and besides I pronounce my name as "Sarah" in English, in Swedish you roll the r and it sounds quite different. 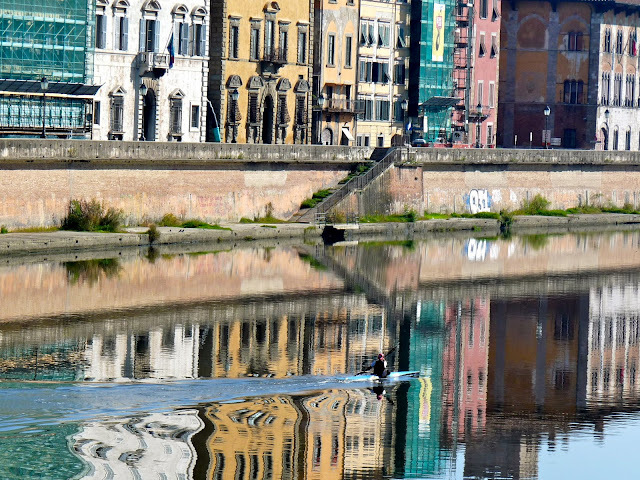 I love the reflections in the water and how you captured them! Those are beautiful! I would love to hang those on my wall!